community members can map Census data for social research. After a successful pilot this past summer, the Data Service Studio (DSS) has now launched the NYU Spatial Data Repository service, which allows NYU researchers who require geographic information systems (GIS) data to easily find and access it directly through ArcGIS software or by downloading it through the Libraries website. This new service has enabled the DSS to add even more spatial data to its collection while making it easier to access. The GIS services at the DSS support teaching, learning, and research with geospatial technology across the University. The Spatial Data Repository (SDR) is a welcome addition to the GIS services long provided by the Data Service Studio (and previously by ITS Statistical Computing). The DSS provides free access to and actively supports the use of ArcGIS software, spatial data, and training modules. Produced by Environment Systems Research Institute (ESRI), ArcGIS includes mapping and analysis software such as ArcInfo and various components like ArcMap and ArcCatalog. Although ArcGIS is not the only GIS software available on the market, it is the clear market driver—nearly all other GIS software is interoperable with ESRI’s spatial data file type, the shapefile. Currently, much research is being done that utilizes spatial technology. GIS has enabled researchers to integrate various data into one system, overlay map layers, analyze and model spatial data, and visualize the results in maps, reports, and charts. As a result, the DSS has seen a significant increase in the number of GIS users from many departments, disciplines, and administrative units across the university. GIS use at NYU is particularly common in the urban planning, transportation, environmental planning, housing, real estate, public health, political science, archaeology, history, food studies, economics, epidemiology, and urban design fields. One of the most time-consuming tasks when conducting research that involves GIS is finding and accessing relevant spatial data sets. Since its inception, the DSS has provided access to spatial data and helped members of the University community find other available data (such as public data from the City of New York). Prior to the Spatial Data Repository, however, those with GIS data needs had to physically come to the Library and meet with a GIS specialist or data librarian to get the data they needed, which was then delivered via physical media or copied to a memory stick. Additionally, even though some of the data is freely available, downloading the giant files is time-consuming and repetitive. For example, if a researcher was looking for data on a small study area like Greenwich Village (approximately a 0.20 MB file), they might have had to first download the whole New York City data set (a 250 MB file), or even the entire New York State data set, and then extract the needed subset. This is primarily due to the way government agencies distribute their data in a packaged, or zipped, format. It became very clear that the DSS needed a better way for researchers to find and access spatial data, and so the idea for the NYU Spatial Data Repository was born. The SDR launched in August 2011. It is the result of more than a year of work with input from seven main team members in ITS and the Division of Libraries, with many others consulting. The SDR contains more than 145 datasets, most of which contain ESRI data and frequently-used public data from the City of New York, such as NYC Community Districts and NYC Streets (LION). Using the SDR, researchers can quickly and easily find available data without having to visit the DSS in person. They can access all the data they need much faster and more easily, whether it’s for a small park, a community district, or the entire country. 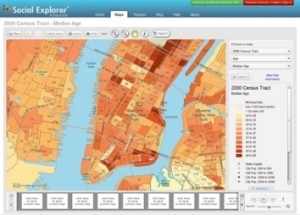 GIS technology from Esri allows NYU community members to create maps using diverse data sets. 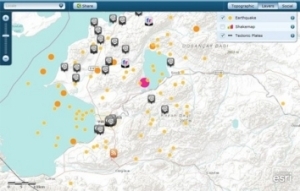 This map of the October 2011 earthquake in Turkey displays near-real-time data from social media sites YouTube, Twitter, and Flickr. The SDR service is continually evolving and project team members already have many ideas for expansion and future improvements. For instance, we plan to move away from downloading through the GIS website and incorporate the data collection into the Libraries’ wider search environment. The DSS will be working with the Libraries’ Knowledge Access and Resource Management Services (KARMS) department to determine how to best simplify searching, discovery, and access to the spatial data sets residing in the SDR. Of course, the DSS will also continue to expand its collection of spatial data to meet the needs of its clients. This will include continually refreshing ESRI data and data derived from free sources as well as considering new licensed data resources. Another important area of collection development will be to include data sets created by NYU faculty members and others who want to share them with the NYU community. Because data creators often want to share the results of their research with colleagues outside their own institution, the DSS will also prioritize providing wider access to original data and crafting a preservation plan to ensure long-term access to our collections. If you use GIS, or would like to, the Data Service Studio offers training on GIS software and accessing data through the SDR several times each semester; see the Libraries’ Classes website for current offerings. Additionally, the DSS GIS website has documentation available to get you started, and consultants at the DSS are always available for one-on-one help. If you have feedback on the SDR, or are interested in contributing your own spatial data, please contact the Data Service Studio by sending an e-mail to data.service@nyu.edu. The DSS at NYU is a joint Information Technology Services (ITS) and Libraries facility on the 5th floor of Bobst Library that opened in fall 2008. The DSS is a center for statistical computing, GIS software, and data-related research. It also provides services and support for all parts of the research data lifecycle. For more information, see the Data Service Studio website. Samantha Guss is NYU’s Data Services Librarian. Himanshu Mistry is the GIS Specialist and manages GIS services at the Data Service Studio. He has worked with NYC Department of City Planning as an urban planner-designer.